This route uses the gentlest ascent track on the mountain with additional acclimatisation day option at 4,200m - it's also the most spectacular. Passing up through montane forest, bamboo and heather zones to glaciers, then down past spectacular chasms, jagged peaks and the glaciated "U" shaped valleys and waterfalls of geography text books. 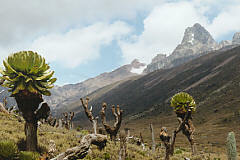 Drive from Nairobi to our hotel on the western slopes of Mt Kenya. Options for horse riding, fishing and forest natural history walk in afternoon. Here at 2,000m you begin acclimatisation as you relax and prepare for the trek. Short drive, crossing the equator en-route, to the Sirimon Park Gate. 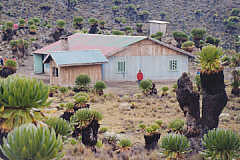 From here we trek up through magnificent montane forests, bamboo and giant heather zones before reaching the high altitude moorland and our first hut, "Old Moses" at 3,340m. This first day's gentle trek takes 3-4 hours and climbs 690m. Up the spectacular Mackinder Valley past strange giant groundsel and lobelia plants to emerge onto what looks like a set from Star Trek - Shipton's Camp at 4,236m. This is a surreal setting below the towering peaks and glaciers, with its resident populations of bizarre rock hyrax and beautiful sunbirds. For better acclimatisation you can take a rest day at Shipton's. Short walks possible on the summit circuit here. We normally climb about 370m to Hausberg Col before returning for lunch. Climbing high and sleeping low is excellent for acclimatisation - but you can do that almost as well lounging in the sun watching the eagles! Early start to reach Pt Lenana at 4,895m for sunrise. The climb starts on frozen scree and continues on a rocky track with some very minor scrambling. With a good moon you barely need a torch. Without a moon, then the pollution-free sky, bang on the equator, gives you as good a view of the stars as almost anywhere on Earth. 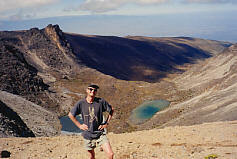 The climb takes between 3 and 5 hours and to add to the exhilaration Kilimanjaro is usually visible on the horizon. A further 3 hours down to a late breakfast by Hall Tarns in the magnificent Gorges Valley. Then in the afternoon another 3 hours down past spectacular chasms, waterfalls and weirdly eroded lava flows to camp by the track-head in the giant heather zone. A beer after the trek! Short descent through the forest zone to the mountain cabins and afternoon relaxing. Log fires, hot showers, Tusker beers, and beds for overnight. Wildlife viewing in evening - often from your cabin window as the elephant and buffalo graze outside! Descent on a broad track for about 10 kms through bamboo and virgin forest to meet vehicles for the return to Nairobi - usually arriving mid to late afternoon. 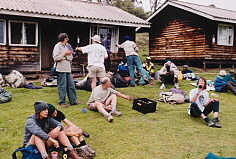 Accommodation is 1 night comfortable hotel, 3 nights mountain huts, 1 night camp, 1 night cabins. All your equipment will be carried by vehicles or local porters, you only carry a day-pack with personal gear. When camping you will not have to participate in camp chores. We buy fresh produce locally and to ensure good standards of hygiene all food is prepared by our own staff. We can cater for special dietary requirements and there are no extra food-kitty payments. US $1,645 per person if you can join one of our scheduled departures - see When we go. We need a minimum of 2 people booked for these trips to run. Contact us for booking status if you are a single traveller.